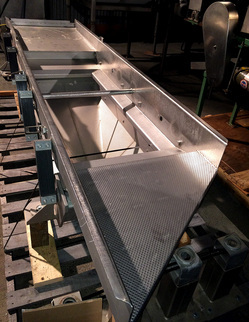 STAINLESS STEEL LIVE BOTTOM HOPPER, FPEC Accumulation Hopper model SCL-930. 84 inch long by 50 inch wide by 48 inch deep tapered hopper with horizontal shaft anti-bridging paddle agitator, over an 81 inch long horizontal unloading screw 12 inches in diameter, with 4 inch high flights on 12 inch centers. Complete with discharge door with pneumatic cylinder. 81 inch infeed height, 31 inch discharge height as configured. 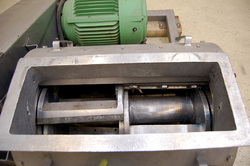 1.5 HP 3 phase agitator drive. 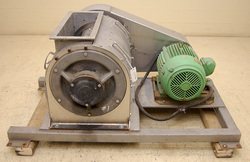 Missing 7.5HP screw/auger drive, otherwise this hopper screw-feeder is in stock at Alard in very good condition. Available for immediate shipment as-is, or can be serviced by our shop prior to shipoment, including main drive installation, to assure excellent operational condition for timely shipment. VIDEO DEMO of our DITO DEAN Model T15S BATCH PEELER, manufacturer rated for 15 Kg (approximately 33 lbs) load capacity per batch, and about 400kg/hr on potatoes, peeling potatoes and beets. Complete with wavy abrasive peeling disk, and knife peeling disk, which can be interchanged at will. Stainless steel and aluminum construction. 110 volt single phase (standard household current) drive motor with operator on/off and timer controls. As of this writing, this batch knife peeler is in stock at Alard, in EXCELLENT operational, mechanical, and cosmetic condition, ready to go and available for immediate shipment. OR find it on our general listings page under "P" for PEELER. ...food grade all stainless steel, configured for products up to 2 inches high, with a 21 inch wide by 84 inch long stainless steel thru conveyor. 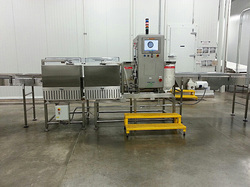 Complete with (2) stainless steel takeaway / reject conveyors, each with push-off-to-bin reject devices: one for contamination, one for mass detection (checkweighing). Complete with stainless steel enclosure touch-screen operator control panel. 220 volt single phase electrical input, requires 80psi compressed air for reject stations. 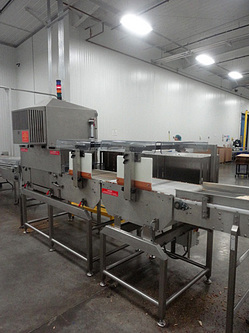 This food grade stainless steel product inspection system was new in November 2010, was used for three years, and is represented by it's owner as being in EXCELLENT operational condition, available for immediate shipment from a midwestern US location. 150 GALLON stainless steel STEAM JACKETED KETTLE with twin motion SCRAPER-AGITATOR, and TILT discharge, Groen Model TADN150. 42 inch diameter by 32 inch deep hemispherical bottom stainless steel vessel, with pour lip. The mixer vessel has a bottom stainless steel steam jacket manufacturer tagged for 100 psi steam pressure. 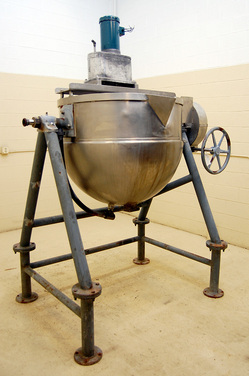 The kettle is topped by a stainless steel mixer bridge, with an anchored scraper agitator, and an offset "christmas tree" style agitator, both driven in common by a single 3 phase drive. The kettle is mounted on a painted steel frame designed so as to allow clearance for a tote or drum to be placed beneath the discharge. The kettle pivots on the frame, with manual crank / tilt-to-dump mechanism, with a 73 inch infeed height, and a 37 inch discharge height. As of this writing, this tilt kettle with scrape-surface agitation is in stock at Alard, it's steam jacket has been hydrostatically pressure tested and confirmed sound (no leaks), and is in the process of being cleaned and serviced in our shop to ensure VERY good operational condition; --available for timely shipment. 24 inches wide by 9 feet 6 inches long, with all rigidized / non-stick dimpled surfaces; all stainless steel. Consists of a 24 inch wide by 30 inch long solid infeed section, which leads to a 24 inch wide by 60 inch long screen area, leading finally to an angled discharge section which allows the flexibility for feeding onto a 90-degree cross-conveyor, or for straight through discharge. This discharge section is 30 inches long at the right-hand edge of the conveyor, and 6 inches long at the left hand edge. Underside collection pan (also rigidized / dimpled surface) for grading or dewatering with 6" center bottom outlet. Includes legs (not installed in pictures) configured for a 30 inch infeed height and 27 inch discharge height. Configured with quick-release hooks for two 30 inch long screens with a 1/2 inch step from one to the next. Came in / is currently without screens, and is offered withOUT screens; OR can be configured with two tri-rod screens per original Key factory setup; --OR can be set up with a single screen without a step: per buyer preference. All food grade stainless steel construction, with all surfaces other than the conveyor sides of rigidized non-stick dimpled surfaces. New style Key eccentric with 3 phase motor to be wound to buyer voltage specification. As of this writeup, this Key ISO-FLO vibrating shaker-grader is in stock at Alard, in good condition, and available for timely shipment. ...chopper / grinder / garbage disposal, for particle size reduction by cutting, shredding, or granulating, with cutitng action; including tough or fibrous materials such as vegetables, fruit rinds, roots, pulp, bark, & etc. For particle size reduction from food production, to garbage disposal. 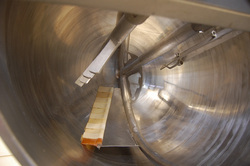 The product is retained in the cutter cavity until the particle size has been reduced to the point where it can pass thorugh a bottom screen (can be sized to buyer specification). 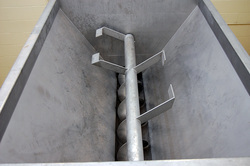 23 inch by 8.5 inch feed throat leading to staggered 12-inch heavy-duty blades horizontally mounted around a 5 inch diameter horizontal shaft, in two side-by-side sections (see picture), with (6) blades on each side. 22 inch by 28 inch open bottom discharge. 30HP 3-phase V-belt drive. The blades are staggered so that only one 12 inch blade is in contact with the product being cut at any given time, reducing shock and allowing for smooth continuous cutting. 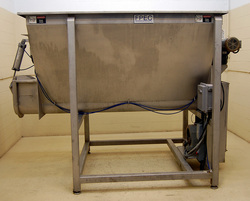 Food grade T304 stainless steel construction, including tubular frame, without legs as currently configured, with a 30" infeed height, and floor level discharge. As of this writing, this multicut knife cutter is in stock at Alard, in good condition, availabel for timely shipment.